I love books for a wide range of reasons, but one of the main ones is because they’re always there when I need them most. When I was 12, a few months before I started my blog, my granddad died and it was something that affected me hugely, us being so close and me being so young. During the months after, I turned to books to help me through and one of these books was Jessie Hearts NYC. For this reason, it’s a book I’ve recommended a lot and Keris’s books, like Jessie Hearts NYC and Emma Hearts LA, are a great place to start for readers who are starting to read YA. I started reading YA when I was around nine or ten, and The Princess Diaries was one of the first YA books I read. I raced through the series right away and still love the books just as much as I did then. Although they were written quite a few years ago, they’re still extremely relevant and Mia was one of the first characters to teach me about feminism and important issues. She’s one of my literary role models! It’s a book you either love or hate, and luckily I was one of the people who loved The Catcher in the Rye. I love how it voices realistic teenage feelings and I just want to give Holden Caulfield a big hug. It’s a book I really want to re-read soon, especially as it’s been a while since I read it. I reviewed it here. I don’t know where to start with this book because I love it so much. The Stonewylde series is the best book series I’ve ever read and the books are incredible. We all have that one fictional world where we’d do anything to get to it and Stonewylde is mine. It’s the place I can perfectly see when I close my eyes and it has influenced my life in so many ways. I wouldn’t be the same person today if I hadn’t read it. I love Fangirl for so many reasons, but the main one is that I feel as if I am Cath when I read it. We’re so similar and I love her passion for the books she reads and what she writes. The relationships in the book – Cath’s relationship with her sister, her dad and Levi – are written so well and in such a relatable way. I ADORE it! What books changed your life? Have you read any of my life-changing books? So many – but the ones that have really stuck and the ones that have filtered into my own writing. I call it book soup – they change sometimes, but always from the same core choice. Today I’d go for: Richard Adam’s Watership Down – first full length novel I read, it was like going travelling on my own – apart from the rabbits; Aldous Huxley’s Brave New World – so weird, extraordinary; Margaret Atwood The Handmaid’s Tale – science fiction with heart and feminism, what’s not to love? Emily Bronte’s Wuthering Heights- the power of that story swept me away; Alf Proyson’s Mrs Pepperpot – so much fun, they helped lift me out of sadness when I was young, I used to hide behind the wash basket to read them! So happy to see someone else who loved Mrs Pepperpot! I loved those stories so much, I used to write my own (terribly spelt) versions and illustrate them. There have been so many books that I’ve adored, and I think have shaped me in some way, but I think Forgive Me, Leonard Peacock is one that has changed my life so much. It’s my all-time favourite book (I know, a big statement to make!) because f just how moving it is. It really opened my eyes to the issues raised, and how important they really are. I had no idea suicide affected people in that way, but now I know, it’s so important to me. I can always come back to it to cheer me up (because it’s not all gloomy) – there are some moments that are so funny, and that I laugh-out-loud every time I read it. I can’t recommend the book strongly enough – my heart aches every time I think about it! It has changed me so much. I absolutely loved Fangirl! It was a really sweet story. Have you read Carry On? The Princess Diaries was also a good series – hilarious and exciting! Amy recently posted…Recently Finished Friday! 1. Matilda by Roald Dahl. This is the one book that I always reread. I remember I read this when I was around 8 years old and I could relate to Matilda so much due to our love of books and reading . 2. The Fault in Our Stars by John Green. I remember how much I fell in love with the story and how it reminded me to always keep going no matter how difficult times may get. 3. To Kill a Mockingbird by Harper Lee. I still remember being so shocked and disgusted by the racism and prejudice that plagued that era and it broke my heart to see how people were treated just because of their skin colour. 4. The Sky is Everywhere by Jandy Nelson. I remember reading this book in a day and then finishing it and wanting to read it all over again. Everything about that book was just perfect. 5. The Skulduggery Pleasant series by Derek Landy. I LOVE THESE BOOKS. 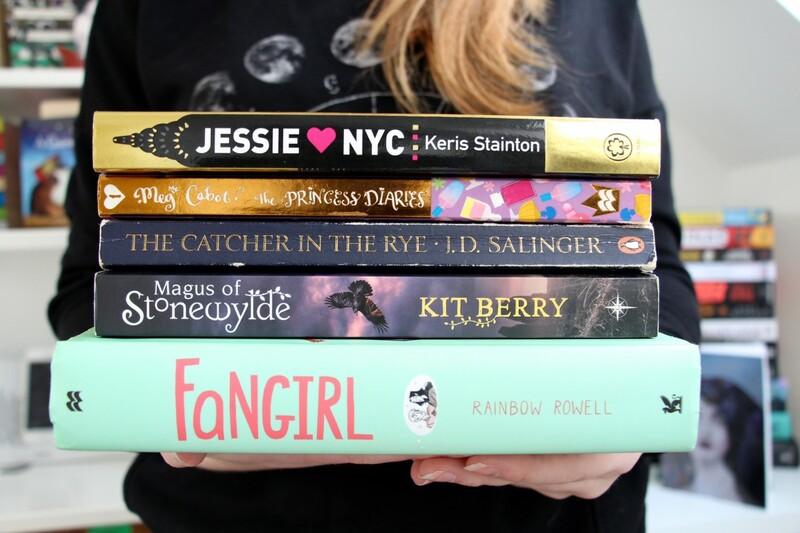 They’re the kind of books that I feel will always be there for me. The characters feel like my best friends, the humor is amazing, the writing is amazing, the plot is incredible and GAH I LOVE IT SO MUCH. 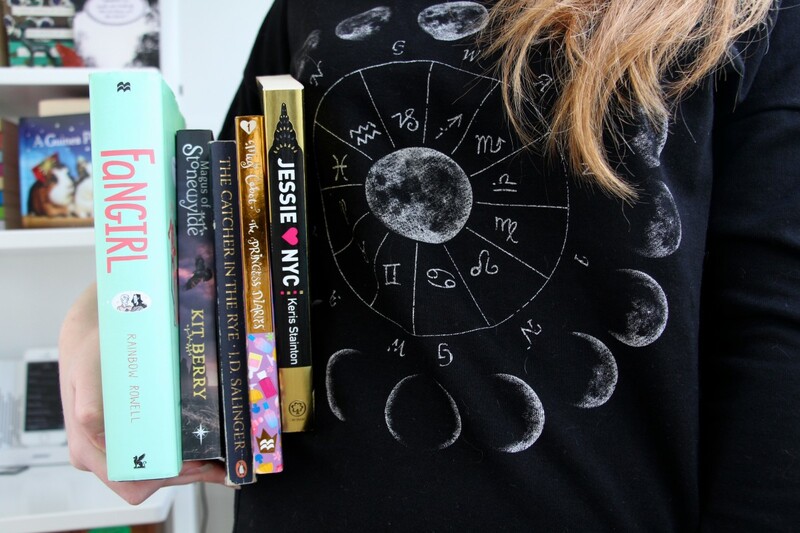 Kyra @ Blog of a Bookaholic recently posted…Stacking the Shelves #83 – I WENT TO THE LIBRARY AGAIN BECAUSE THE LIBRARY IS A BEAUTIFUL THING. Love your choices, Lucy. For me, it would have to be I Capture the Castle by Dodi Smith, The Curious Incident of the Dog in the Nighttime by Mark Haddon, Charlotte Sometimes by Penelope Farmer, Wuthering Heights by Emily Bronte, Maggot Moon by Sally Gardner, The Bell Jar by Sylvia Plath. All had a massive effect on me as a teenager and then as a writer. You’ve convinced me to read all these books now! A book that changed my life was most definitely ‘How to Build a Girl’ by Caitlin Moran! If you have not read it, I totally recommend it! I’ve never thought of books that have changed my life. I was interested to see your choices. I think, off the top of my head, Harry Potter would have to be there for me as well as Apache, by Tanya Landman, and Jane Eyre. They’re three books that made me fall in love with reading and without that I wouldn’t have chosen my course, written my book blog or written my stories. Interesting thought. I love this post, Lucy! It’s amazing the impact certain books can have on us. For me, it was everything by Jacqueline Wilson. I started reading her books when my parents were splitting up. Not many of my friends had parents who were divorced and I found so much comfort in reading about characters in similar situations. Her books will always have a special place on my bookshelf, so I definitely understand how special certain books can be for everyone. Thanks for sharing your special books.